I'm looking forward to our long weekend and a visit to the farm this weekend. When we're at the farm, I look forward to catching up with everyone, relaxing, eating home cooked Southern food and trying my hands at something new at the farm. My goal this is year is to milk the goats once again when they are ready. So I'm keeping my fingers crossed for our quick getaway this weekend, since we have a snow storm prediction that's calling for a few inches of snow. I didn't think I'd find red currants again but I was fortunate enough to run into them last weekend. Last year I made a simple jam for my whole wheat chocolate layer cake. 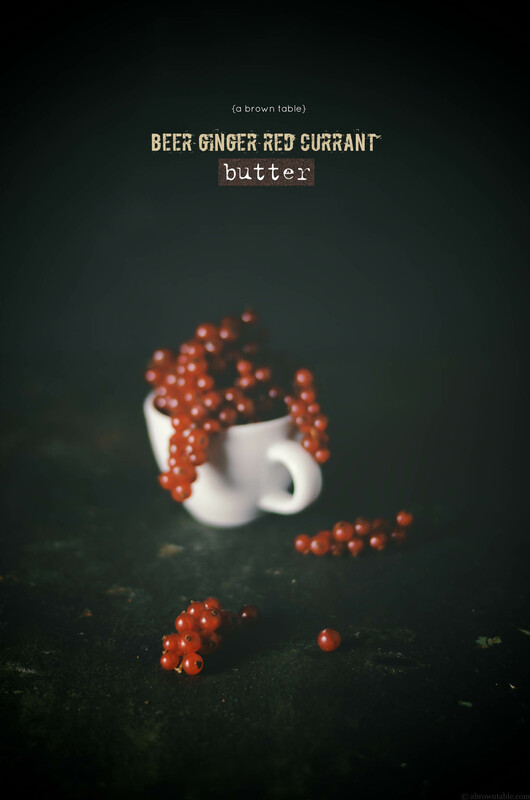 This time, I made a smooth butter that's infused with a whole bunch of flavors I would never think of pairing, until now! 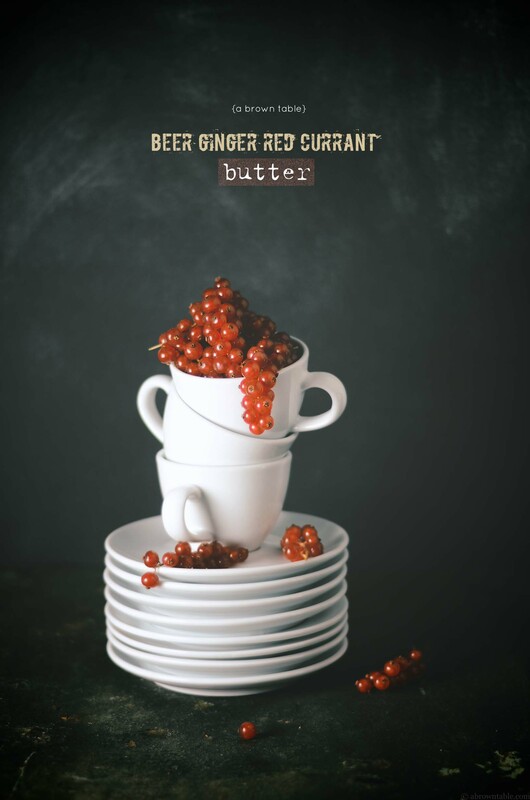 I'm amazed at how delicious the pale ale balances the tartness of the currants, this is one recipe that I will definitely scale up if I ever run into a huge stash of red currants (which I sincerely hope I will). I almost forgot about the ginger! The fresh ginger infuses a lovely flavoring in this sweet medley. 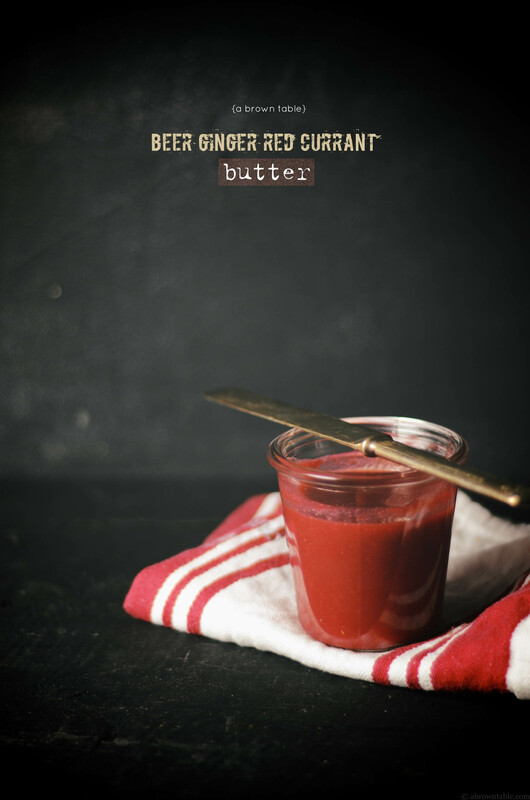 I like this butter to be less sweet and more tart but if you want to reduce the tartness, I recommend increasing the sugar to around 1/2 cup. I recommend using a deep saucepan as the beer will tend to foam and rise as the liquid heats up, this reduces spillage and a potential kitchen stovetop mess. What's a better way to wake up in the morning and eat your beer on a slice of your toast! 1. Rinse the currants under running cold tap water. Carefully remove the fragile currants from their stems and place them in a deep bottomed saucepan. 2. Add the rest of the ingredients to the saucepan and heat on a medium high flame with constant stirring until the sugar is completely dissolved. Reduce the flame to a medium low and stir the contents occasionally. Cook the butter for about 1 hour. During cooking the currants will burst and release their pulp and juices. 3. Place a sieve over a clean bowl. Pass the contents of the saucepan through a sieve and using a large spoon, press the fruit in the sieve to release as much of the fruit pulp and juices as possible. Stir the butter that collects in the bowl. It will have a thick consistency. Transfer and store in an airtight container until ready. 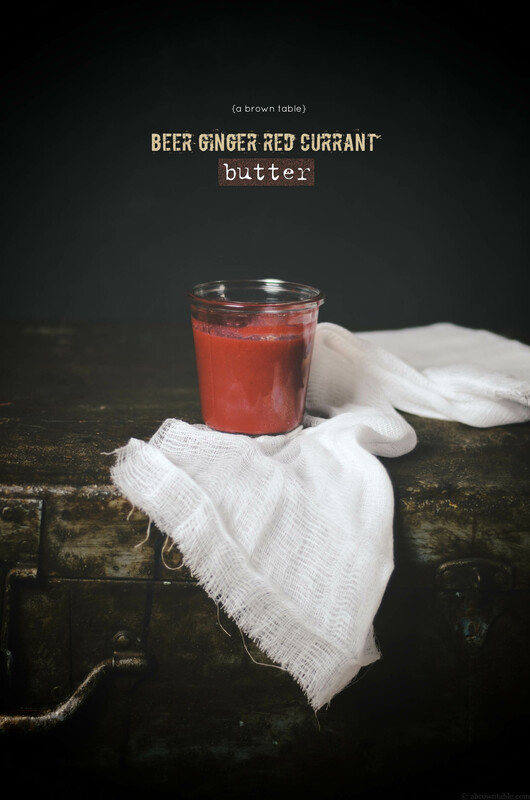 Though the butter is ready to serve immediately once cooled, I find the flavors to be much more developed and tastier the next day. 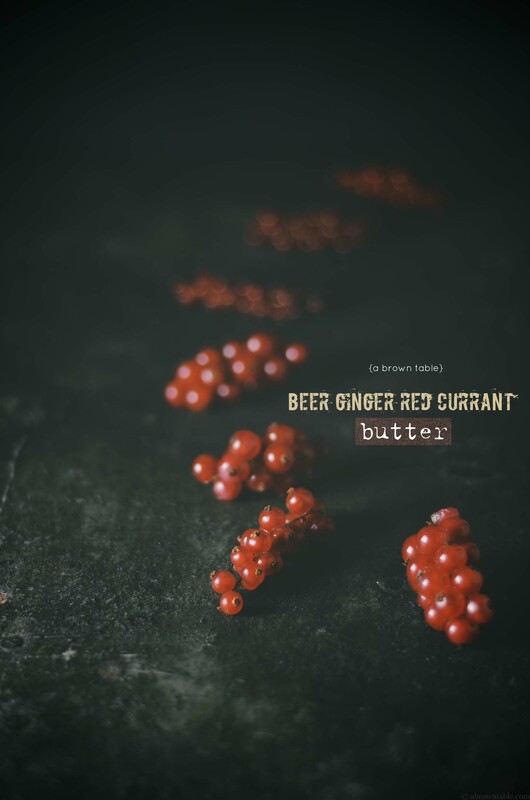 In "Butter", "Ginger", "beer", "red currants"